Last April, I became aware of a Thing called the 100 Day Project. It was created by the artist Elle Luna, partly as a follow up to her book The Crossroads of Should and Must, which was a follow up to this article on Medium that went viral. Properly viral. I loved the idea of the 100 Day Project, I came up with my own idea for what my project could be, or so I thought, but it quickly ran dry and other things got in the way. It turns out that committing to 100 Days of anything other than running is awfully hard work. What did happen though, some months later, was that I bought the book. My birthday was approaching and I was off to spend it alone on a Scottish island. Well, I was going there to run the Tiree ultramarathon, but other than that it would just be me. At the time, I had recently broken up with my boyfriend after almost two years together. It wasn’t a very nice ending and it left me pretty distraught and reeling from what had just happened. I was at the stage of starting to contemplate trying to put myself back together again, and accepting that yet again I had ignored signals that were right there in front of me, and had let things go beyond a stage where I should have acted on them. I bought the book on Kindle because I was flying on a very small plane and only had limited bag space. I am a very fast reader and with three full days away, there would be a lot of reading time. I was a little concerned as to whether the images would still come across as intended, but there wasn’t much option in this instance. My rucksack, with everything I needed for three days loafing and one day to be spent running an ultramarathon, only just fitted in the overhead locker on the plane, which was slightly bigger than the one below on the way out (this is the one for the way back home). I sat on the plane on the runway and started to read while the plane filled up with passengers. I was hooked immediately. And then, the roar of a jet engine, the sudden rush of speed, the bump of the little wheels hurtling along the runway, the pressure on my chest as we took off and climbed up into the sky. 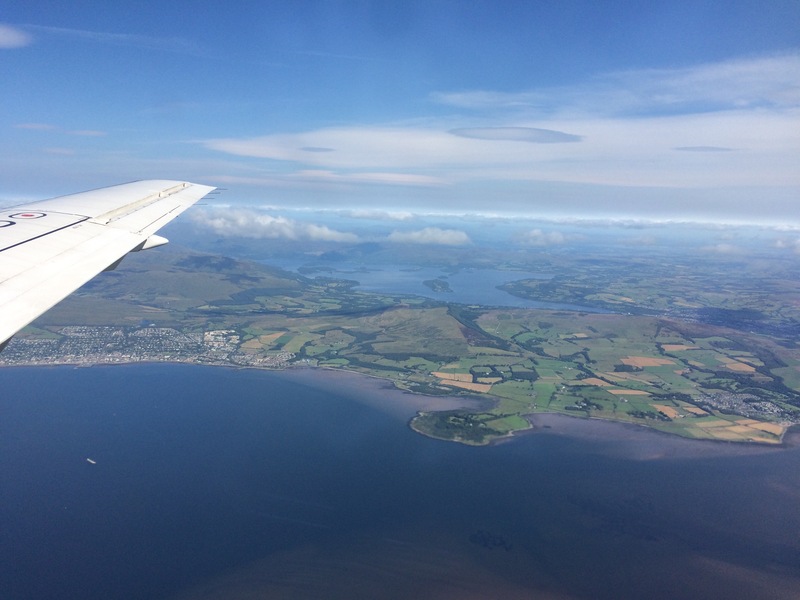 The tipping sensation as we banked to turn away from the airport, and then the wonder at Scotland’s west coast lochs, mountains and islands seen from above on a beautiful clear day tore me away from the book. 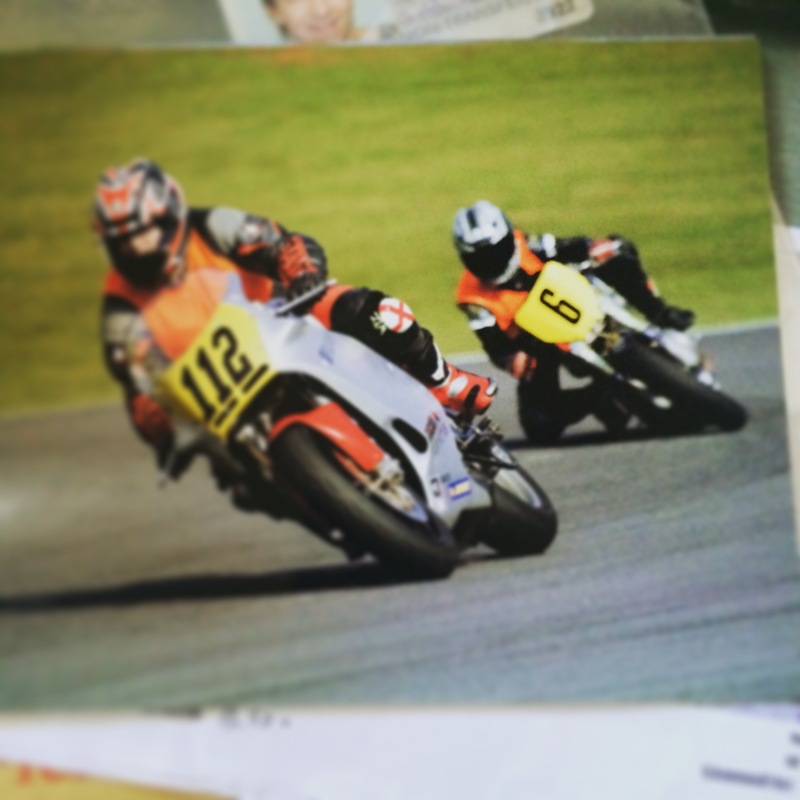 This was my first taste of what I needed to accept as one of my Musts, and it was one I’d not felt for a while.Memories of riding my motorbike fast, of being lined up on a grid, my left hand wrapped round the clutch lever, right hand holding the throttle, waiting for the lights to go out, launching myself carefully off the line, of tipping into a bend, of dragging my knees on the tarmac, of the oppressive heat of a hot day spent on a hot bike in hot leathers. No. 6, on a 583cc Ducati Monster. First ever race, first ever knee down. Clearways at Brands Hatch, April 2007. My least favourite corner. Almost. This was Me, or rather a huge part of me that I had had to let go a long time ago and one that I desperately wanted back. And I’m still not sure how and if they fit together or not, and if not, which one to choose and how to go about it, and how to let go of the other one. There’s still a whole lot of Should in there when I think of the other Must. I wheeled my road bike out of the garage recently to give it a bit of attention before its MOT this weekend. It has been a long time since I rode regularly, longer than I care to admit to. I used to ride between 350 and 500 miles a week, riding an ever changing list of bikes 40 miles to work and 40 miles back in all weathers, and then out again at the weekends with friends. Circumstances changed and I had to stop for a bit. There’s a story for another time. And then it wasn’t the same when I started again in Scotland. Riding became about fear, about feeling constantly under the spotlight, about every mistake being noticed and scrutinised, always being asked why I didn’t want to go out. The road surfaces near my house are absolutely dire. The weather is less than bike friendly here, and we had a dreadfully wet summer last year. My drive is mostly gravel and on an awkward corner with an equally awkward slope, and it’s not wide enough to get my bike in and out without moving my car. These are all small things that would never have stopped me years ago, but seem to now. I’d really like to ride on the track again, but I’m only too aware of where my confidence is and I’d like to get some of it back before I put my race leathers back on. Last year though, only a couple of weeks before we split up, we rode down to the ferry at Wemyss Bay and then headed over to the island of Bute. We ended up coming back via the Rhubodaich-Colintraive ferry, the shortest ferry trip in Scotland. This brought us back to the mainland via the Cowal peninsula, empty, remote, wild in places. The roads were tremendous and R started to feel a little of the pressure of having someone behind so he pulled over and waved me past. Just for a while, I opened the throttle and left him and the rest of the world behind for a bit, and I rode. I really rode. I could still do it, and it was still there. The tarmac was warm, smooth and flowing. There was no one about and I was completely in the moment, looking only as far ahead as the next corner while still planning for what or whatever was on (or might be just over) the horizon. I wasn’t riding enormously quickly, but I was back to the smoothness that I had known so long ago. The bike felt fantastic, I moved quickly and easily through the gears, clicking up without using the clutch as I’d learnt on the track. The brakes were perfect and my new adjustable clutch lever meant my small hands weren’t straining to reach. 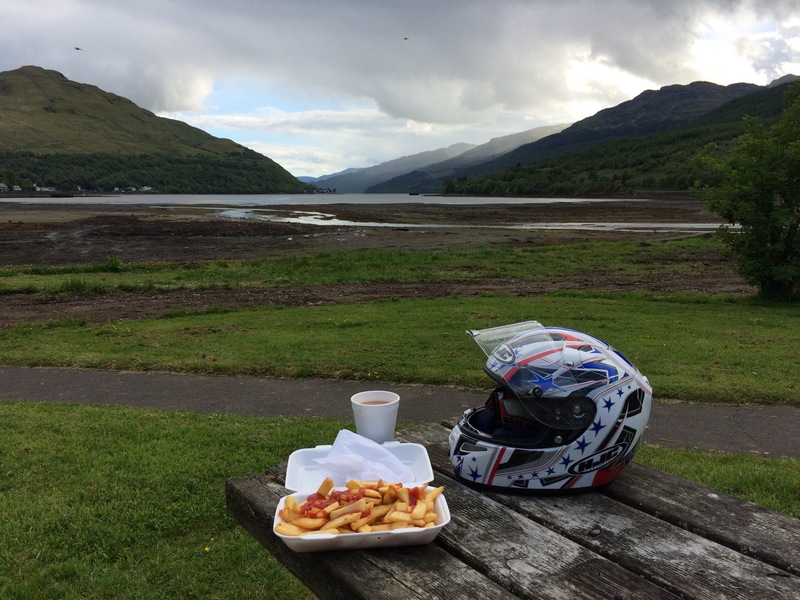 an unscheduled pit stop in Arrochar. a cup of builders’ brew, milk and one sugar. a large portion of chips with loads of vinegar and ketchup. heavenly! And then I had my first ride out in ages a couple of weeks ago, down to the bike shop to get said MOT. It was nerve-wracking, I didn’t ride particularly well, and it was extremely hot. I got to the bike shop a bit late, heart pounding, hands shaking. But I’d made it, and I’d loved it. MOT certificate in my jacket pocket, I started the bike up to ride home. I was mortified when I looked at the mileage on the odometer. I can’t wait to rectify the situation and start adding to the pitifully low number. I’ve not set a target (very unlike me) but next year, I don’t want to feel that sense of sadness when I realise how little I’ve actually ridden. I have a couple of longer rides planned in my head but first I need to grit my teeth, bash through and get my confidence back. It’ll come, and I’m looking forward to all the beautiful places I’ll see in the mean time. the only bike that has really turned my head in recent years. the gorgeous MV Brutale 899R. strictly a sunny day bike and so it will have to stay in the showroom. I have every confidence that you will click up those miles! Thank you! I’m looking forward to it immensely. Thank you! I’m sure it has not stopped raining since I wrote this! !